‘INSTEP Groupe’ is a vocational training group of colleges in France working with young people from different socio-economic backgrounds. Our partnership with INSTEP started four years ago when we hosted the first group of French students in Cardiff. Since then, we have received more than 120 young people providing them with personal and professional development, developing their English language, employability and confidence. 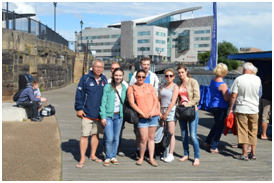 During the French youth stay in Cardiff, they participated in specific personal development, team building, confidence and assertiveness training which are key elements of the programmes. Students undertake work placements for a duration of up to two weeks at local businesses. These internships vary with the skills set, English level and programme of work. (1) Induction training (on arrival): the participants receive a ‘Welcoming pack’ and they attend a ‘training’ session regarding set rules for their stay with their host families; information about the risk management, risk assessment, health and safety training (how to cross the road, as the driving is different from other countries in Europe), maps, bus timetables and they will be issued with individual bus passes. (6) Cultural visits and outdoors activities: St Fagans Welsh Folk Museum, City game, National Museum in Cardiff, picnic, Boulders Climbing, Roath Park boating, Cardiff Bay Fast Boat experience and the Scavenger Hunt. (7) Tasting international cuisine: the young people are invited to an international restaurant in Cardiff to taste different food (some of them have never tasted cuisines other than French). Youth coming from INSTEP are welcomed, they are placed with host families and work placements are organised through LAW and CCW’s network of local partners. People who never travelled abroad before or who never had real work experiences have the chance to interact with and learn from professionals. These experiences will expand their network, help them to develop new skills, improve their communication and language skills and become more confident and open-minded. In addition to training within their specific vocation learners will undertake a work placement, prior to the placement they will receive job advice and training. They will receive advice on preparing a job application form and they will be prepared for a fictional job interview in the medium of English.